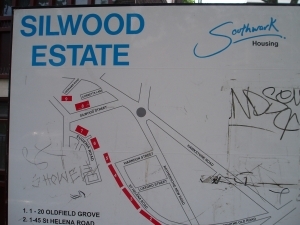 See latest Silwood blog posts. Or visit PlanA our general blog on urbanism, planning and architecture. The Silwood video group is a constituted group Spectacle started in 2001. Since its inception, this extraordinary and unique group has had approximately 200 people through its doors from the ages of 6 to 70. Over the years an unusually diverse range of people in terms of age, race and religious background from the Silwood Estate and neighbouring areas have worked together on a wide range of video projects responding to the regeneration of the neighbourhood. If you live on the Silwood and are interested in getting involved in the Video Group please contact training@spectacle.co.uk and keep checking this blog. Alternatively you can join the spectacle facebook group. Read the latest on the Silwood blog. Read the latest on PlanA. living in the block as the demolition starts around them. In the new flats, under the management of new housing association, no one knows whose responsibility it is to empty the rubbish, 70 year old Vicky has to get onto her hands and knees to clean up the maggots. hilariously and shockingly charts the appalling renovations made to her flat as corners are cut, and shoddy workmanship invades her flat. Coronet cinema in Elephant and Castle back home to Bermondsey from the smells coming from the factories and warehouses along the way. LOOP video group are in the process for editing an exercise video for people who for whatever reason are housebound.